It's hard for me to not stop and smell the candles whenever I'm out shopping... I will smell them all! :) I love the way they make your room smell and how they linger around, long after you've blown them out. They also add an extra little comfy and romantic touch to a space. 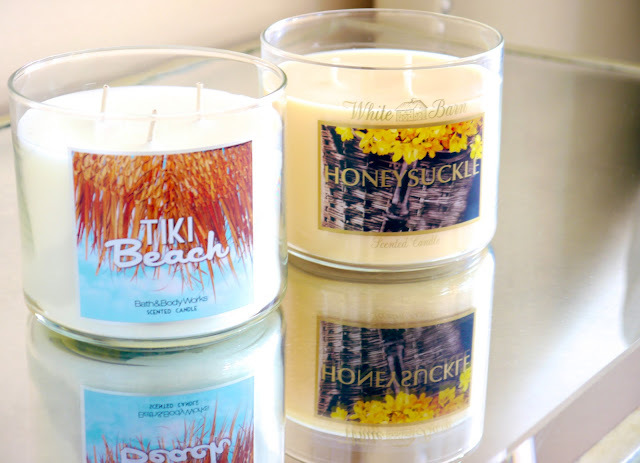 Yesterday I walked past Bath & Body Works and found "Tiki Beach" and "Honeysuckle" which both smell heavenly! Their scents are so good, yet they are still light and delicate. Tiki Beach reminds me of a beautiful day in a warm exotic location. The official description is "A scent as warm as the sun! A luxurious blend of toasted coconut, vanilla musk and orchids brings the glamour of a resort-stay to you." Honeysuckle smells so fresh yet warm and soothing. It reminds me of a calming warm bubble bath lol I guess all of our descriptions of scents depend on our own experiences :) The official description is "An alluring blend of sweet honeysuckle, pink peony and a touch of creamy vanilla capture the essence of walking through a garden in bloom." I am burning Honey Suckle as we speak. Love love love that scent. So tempted to get a few more during their sale. they always have the best scents .. i love the new city scents they have out as well ! I have this Honeysuckle Candle and I love it! Such a fresh and clean smell. I also have the Orchard Peach which I thought would be too sweet but it is actually amazing! I love "leaves" by B&BW! Are you considering doing a room tour? cocktail; spinach, apple, orange, celery, fennel, lemon and ginger. I have to get tiki beach ♥ the smell of beach and vanilla. If you have time read and leave a comment on my blog it got nominated for The Liebster Award. thx in advance. 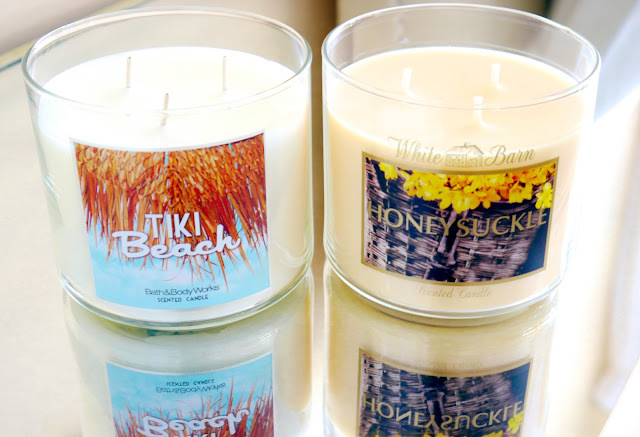 Tiki Beach sounds absolutely perfect ♥ So sad they don't have Bath & Body Works here in Manila! Here's a tip. Once the candles are done and you know how there's still a bit left well I went to Michaels and bought extra wick and my husband took all of the leftover candles and out it in. So basically recycled it. Your right Annie they smell so nice . its hard not to stop by.. But try what I suggested above. Its amazing how much candle wax is left over that you can make into a new one.. Best thing is all the smells from the leftover smells the best! I love Yankee Candles. They have the best smell that I have found. Have fun with your candles! Ooh I liked those in the store too!! But my favorite at Bath & Body Works now is the "First Bloom" scent......so fresh and floral!! I'm in the market for some new candles - I'll have to check these out! Thanks for sharing! I just recently ran into your blog and your youtube channel and I just LOVE LOVE LOVE your blog and channel. I think your just gorgeous first off and also very bright and informative. One thing that surprised me though is that you're into regular paraffin candles so much and you're not using soy, beeswax or vegetable based candles. Especially since you seem to prefer more natural products that are good for you. I'm like you when it comes to preferring organic and natural products and I'm very concerned about inhaling the toxic fumes from candles and the long term effects on my health. The soot produced is a lung irritant and carbon dioxide is also produced as well as other chemicals when the candle is burned, also the wick may contain lead (although they try to enforce the ban of this) and zinc which can release harmful gases when burned. Can you tell me your thoughts on this? Maybe you could do a review on the more natural candles available. A soy wax candle burned in a recycled metal tin is probably the best option.